Thousands of men and woman are currently fighting for our country’s protection in Afghanistan and throughout the world. Back home, the families of these faithful Marines are often left in need of groceries, clothing, child care items and other incidental expenses for the holiday season. The Rotary Club of Coto de Caza/RSM del Sol has joined hands with the Camp Pendleton Armed Services YMCA for the *10th* year to bring some much needed relief and support for these families during the holiday season. Rotary will be providing relief to over 200 Camp Pendleton Marine families by providing cooked hams, $10,000 in commissary gift cards and $10,000 in Target gift cards. Additionally, Rotary will provide the Armed Services YMCA a $5,000 grant to assist with childcare, after-school tutoring and mentoring programs that are crucial to these children who are often suffering with issues due to their parent’s absence. 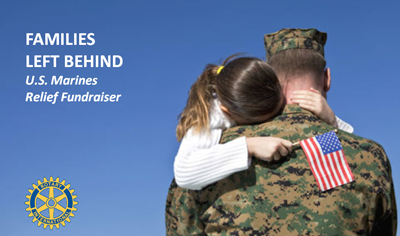 100% of your contribution will help these families enjoy a holiday in a way that many of us often take for granted.